Exodus Wallet is a desktop client or software wallet that allows users to not only store but also exchange blockchain based assets as it has a built-in exchange. It is a relatively newcomer in the crypto world as the wallet was launched only in 2016. However, it has quickly gained popularity among traders primarily due to its versatile design. It displays real-time value of digital assets by means of great live charts. In addition to that, Exodus Wallet also allows users to personalize their portfolio by changing themes, background colour and other features to suit their style and preference. Exodus is a multi-asset cryptocurrency wallet as it supports more than 80+ coins and tokens. It has a simple interface which can be used comfortably even by the novice traders. Using the integrated Exodus Exchange, you cannot buy/sell cryptocurrencies using fiat currency but can only exchange between the digital assets. Exodus is not considered the best option to store huge amounts of cryptocurrency as it is not as robust as a hardware wallet. That’s why it recommends the users to go for hardware wallets like Trezor, KeepKey or Ledger for storing large amount of digital assets. It doesn’t offer any advanced security features to protect the funds except a recovery phrase and password. As it doesn’t store any of the user’s information like private keys, passwords etc on its server, it becomes the sole responsibility of the user to protect their funds. What Exodus lacks in security, it excels in ease of use. As Exodus is a software wallet, you don’t need any additional hardware to connect it to your computer. All you need to do is install the desktop client on your computer. Exodus Wallet works on Windows, Linux and Mac. To get started, you need to download and install the latest version of the Exodus software by clicking on this link. Depending on their OS (Windows/Linux/Mac), you have to choose the appropriate version. As the Exodus wallet is a software wallet installed on your computer, there is no need to create an account. 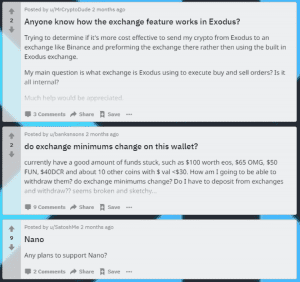 The only way to start using Exodus is to deposit at least a small amount of cryptocurrency like Bitcoin on the wallet. It will only show the 12-word recovery seed after you make the first deposit. Follow the steps below to receive a digital assets (eg. BTC) on the Exodus wallet. Open the Exodus wallet software on your computer. Click ‘Wallet’ located on the left side of the screen. Select the coin/token you would like to receive (eg. BTC) and click the ‘Receive’ button. Now, your screen will display the receiving address. Either you can copy the address or share the QR code to the sender. Once the sender has initiated the transaction, you will receive the funds on your wallet. Congratulations! You have successfully received your first digital asset on the Exodus wallet. There will be a small deduction to cover for the transaction fees. Once you have made your first deposit on the Exodus wallet, follow the steps below to set up your account. Click Backup located on the left side of the screen. Re-enter your password and click the Next button. Once you have noted down all the words, click the Next button. Then, enter your email address on the box provided and click the Finish button so that Exodus will send you the backup link to recover your account in case you had lost your password.Now, your screen will show the message “Your Backup is Complete”. Congratulations! You have successfully set up your Exodus account by creating the password and storing the recovery seed. Follow the below steps to send a digital asset from Exodus wallet to another wallet. Click Wallet located on the left side of the screen. Select the coin/token (Eg. Ethereum) you would like to send from the list and click the Send button. Enter the recipient address and the amount of cryptocurrency (eg. ETH) you would like to send. Then click the Send button. (Instead of entering the address manually, you can scan the QR code by clicking the barcode icon). Then, you will see a confirmation window with the amount and the address. Double check the address to ensure that it is valid and click the Send button. Congratulations! You have successfully sent your first digital asset from Exodus wallet. You will be charged a small transaction fee to send coins/tokens. In addition, to storing your digital assets, Exodus wallet allows you to exchange your coins and tokens. For example, you can exchange BTC for ETH and vice versa. Exodus supports more than 50 different trading pairs. Follow the below steps to quickly exchange your digital assets. 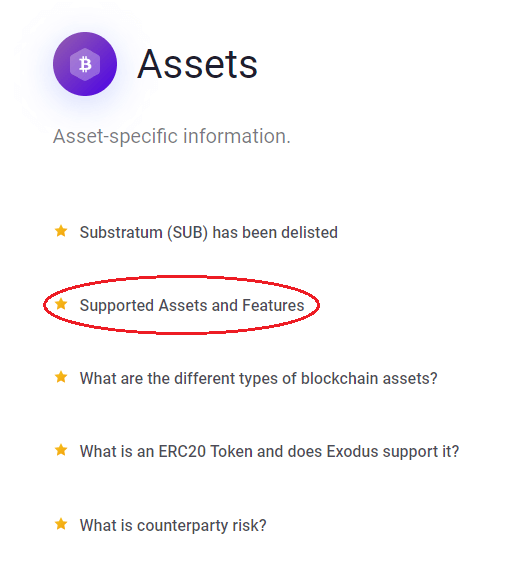 In this example, it is assumed that the user would like to swap BTC to ETH and has already deposited BTC on the Exodus wallet..
Open the Exodus software on your computer. Click the Exchange tab located on the left side of your screen. Select the asset (BTC) you would like to exchange from the left side drop down box. 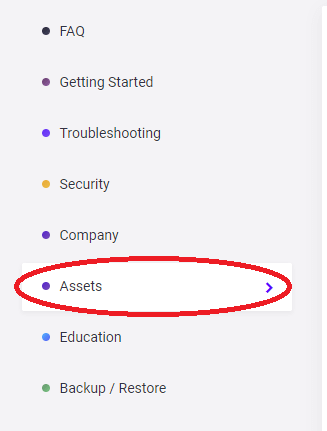 Next, select the asset you would like to receive (ETH) from the right drop-down box. Then, enter the amount of BTC you would like to exchange. You may either enter your own amount or choose ALL / HALF / MIN to populate the amount. The live exchange rate will be displayed on your screen. If it is ok, you can click the ‘Exchange’ button to initiate the transaction. (Exodus wallet gives a 3 second time out to cancel the transaction in case you clicked the button by mistake). Congratulations! You have placed your first exchange order on Exodus wallet and you will receive the asset within 30 minutes to your wallet. Exodus wallet has given full control of users’ funds. Hence, it is your responsibility to protect your account by creating strong passwords and keeping the recovery seed safe. Like any other web wallet, Exodus is also vulnerable to attacks by hackers as the security of the wallet is equivalent to that of the computer it stored on. If your computer is attacked by any malware, virus or other kinds of malicious software, then your wallet will no longer be secure. That’s why it is recommended to use hardware wallets like the Ledger or Trezor in case of storing a large number of digital assets. For smaller transactions, Exodus is a really good wallet as it supports a large number of cryptocurrencies. Like the hardware wallets, Exodus wallets provide the 12-word recovery phrase to recover your digital assets in case you had forgotten the credentials to log in to your account. On the Welcome screen, click the link restore from the backup and click the option 12-word recovery phrase. Next, you will be prompted to enter your 12-word recovery phrase. Enter the words one by one with a space between them and click the Restore button. Then, you will see a pop-up window on your screen with the message “Restore Complete” and a button titled OK. Click the OK button. While making your first deposit, Exodus wallet will send a backup link (URL with your recovery phrase) to your email address. This backup link along with the password can be used to recover your account. Download the latest version of the Exodus software on your computer and ensure that it shows a balance of 0 EUR/USD (depending on your local currency). Next, you will be prompted to enter your password. Enter your password and wait for few seconds. Owing to its elegant and easy-to-use interface, Exodus Wallet is popular among the novice traders. 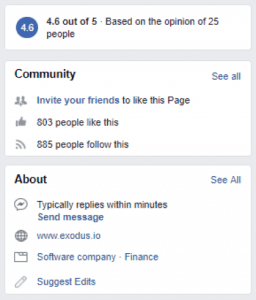 As Exodus itself has mentioned on its official website, it is not suitable for holding a large amount of digital assets, it is less popular among experienced traders. Regarding the security, some users on Reddit have reported loss of funds from their Exodus wallet due to hacking / security breach. But, Exodus has clearly mentioned in its website that the wallet is only as secure as a computer. If your computer is hacked or infected with malwares or viruses, then there is no guarantee about the safety of your funds. Exodus is a desktop or software wallet whereas the Coinbase is a web-based wallet integrated with Coinbase Exchange. Even though Exodus allows you to create a more diversified portfolio, it doesn’t provide better security when compared to the Coinbase Wallet. The Coinbase Wallet is trusted by millions of investors mainly due to its unmatched security features. As the Coinbase Wallet allows the users to buy cryptos using fiat currencies, it is much easier to buy and store the assets. On the other hand, Exodus allows the exchange of crypto-to-crypto only. Both Exodus and MyEtherWallet don’t recommend users to store large amounts of digital assets on their wallets. Regarding security, Exodus is considered better than MEW as it has undergone a lot of hacks or security breaches in the past. Even though both wallets provide support for more cryptocurrencies, MEW supports only Ether and ERC20 tokens, whereas Exodus allows users to store more coins and tokens. MyEtherWallet doesn’t offer any kind of recovery procedure whereas Exodus wallet helps the users to recover their account in case they had forgotten their password.